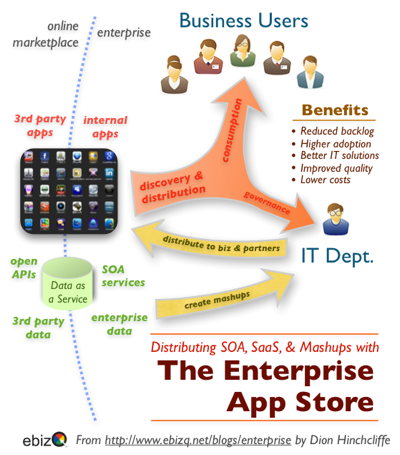 There’s been some useful discussion recently about using the app store model for distributing enterprise software and services within organizations. Up until now, most IT needs in the majority of businesses have been met through one-size-fits-all delivery of solutions that are either hand-crafted or purchased and then imposed on all. It’s been this way for at least three decades, but now this aging and inadequate process is beginning to improve. The premise of an app store model for enterprises is simple: By removing the middleman, the famous bottleneck between the business and IT demand can be reduced in many cases. Application backlogs can shrink, consumption of internal and external IT resources will increase, and fierce competition to provide the best solutions to niches can greatly improve overall quality (the long tail of IT argument), all while reducing costs. At least, that’s what is possible if we look at what’s happening to the non-enterprise software market today. Fellow Enterprise Irregular Jevon MacDonald posits this as a likely outcome of the emerging Personal Enterprise. Current trends involving the mass personalization of services and the consumeration of enterprise IT have come together and resulted in ready-to-use catalogs of IT solutions that are much easier to acquire and consume today than they from traditional channels. Jevon cites Force.com, Intuit Marketplace and Get App as current examples of app stores for enterprises and SMBs, to which I’d definitely add IBM’s Smart Market. Google is even rumored to be ready to release an enterprise app store of its own soon. We have built an App Store that supports the abstract deployment of both services and visualisations by users, and allows them to be “mashed-up”. The end user contracts with each party in the supply chain, so no prexisting commercial commercial relationship is required between the parties in the supply chain. We have done this as means to munge data, services, analytics and SaaS offerings from disparate providers together to support niche provision within the financial services industry, but the potential applications are much broader. So far we have only opened up non-commercial contributions to the public beta, but the paid stuff is all done at the technical level, just waiting on legals. Would welcome feedback, and participation from content providers who want to build content and sell it on our platform. Just sign up at http://www.hedgehogs.net and contact me, and we can arrange a guided tour. Interesting Article, Dion. Fiberlink recently had a Webinar on this same topic, covering a lot of ground on what can be done to manage the Enterprise App Store once it becomes established in a company’s IT infrastructure. The presentation specifically addresses how the enterprise can manage, distribute, and track the apps that are being used by their employees.